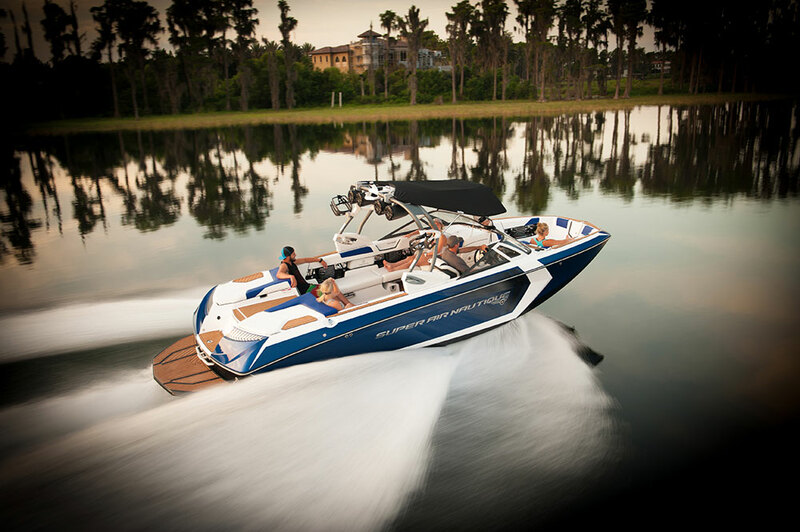 Nautique’s new-for-2014 Super Air Nautique G21 has, well, everything. 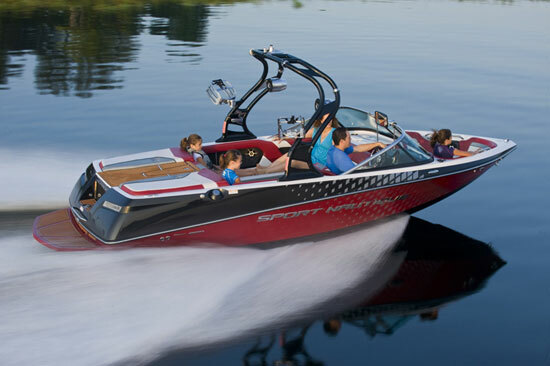 You would be hard-pressed to find a feature that the new Super Air Nautique G21 doesn’t have. The new-for-2014 model debuted in November and it’s making a huge splash in the marketplace. 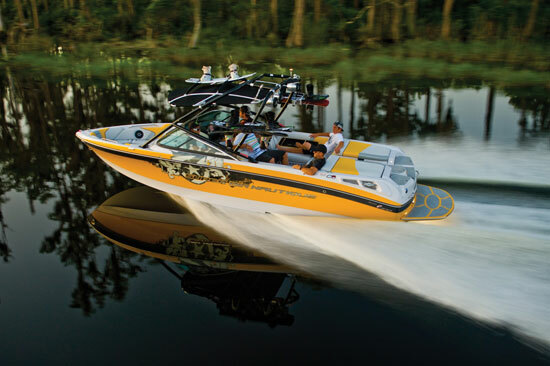 For example, the G21 has become the official towboat of the USA Wakesurf National Championships. How did that happen so fast? 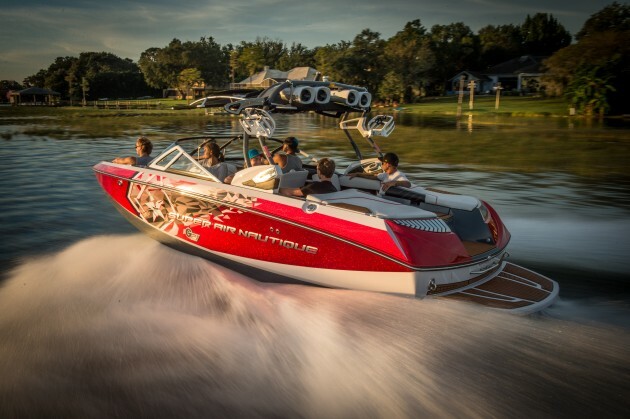 The Super Air Nautique G21 is packed with features for maximum fun on the water. Well, the Nautique Surf System (NSS) has a lot to do with it, and you can read the full story on that system here. Briefly stated, the NSS uses a plate on the transom that extends outside the running surface on hydraulic rams, which gives the driver the ability to create a wave on either side of the boat instantly. The cool part is the system works so quickly that it allows you to switch the surf wake from side to side as swiftly as the rider can rider over the crest in the middle and drop in on the other side. 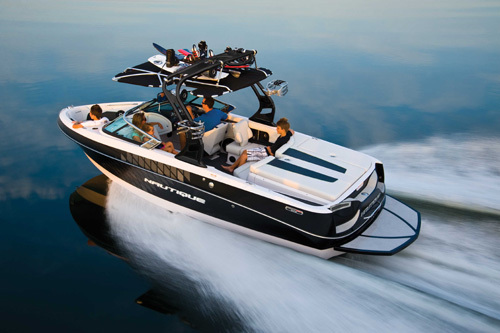 The system is part of the Nautique configurable running surface, which includes the Waveplate on the transom and up to 2,850 pounds of factory ballast, all of which is tied into the LINC display on the dashboard. The LINC system is offset to the right of the steering wheel rather than directly ahead of it so you don’t have to reach through to make adjustments. The LINC system controls all wake-tuning settings and even stores rider preferences for wakeboarding, wake surfing, or wake skating, all of which are just different enough to require distinct settings. An overhead view of the Super Air Nautique G21. All that weight makes one of the biggest double-ups I’ve ever seen. Check out the video here and skip ahead to 1:40 to see it. Also new this year, Nautique introduced the Surf Pipe on the G21. Rather than have exhaust exit on the transom just beneath the swim platform, the Surf Pipe directs exhaust underwater and releases it ahead of the propeller, which disperses exhaust gases over a wider area. Riders can breath a little easier. All water ballast compartments are belowdecks, so there are no bladders taking up valuable stowage space beneath the seats or in the compartments flanking the engine. Nautique has tucked a lot of boat in a 21-foot package. It comes at a price, though. Base MSRP is $109,875. For the money, you get a spacious bow fitted with forward-facing lounges, four cupholders and lots of room thanks to the “spade” design. The lounges come with flip-up armrests and grab handles tucked into the coaming panels and stowage underneath the cushions, which support themselves when open on dual-action hinges. 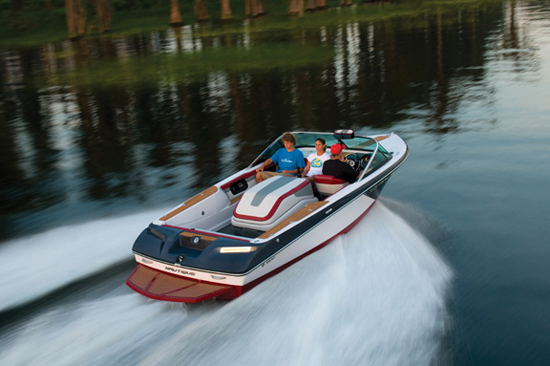 In the cockpit, there’s abundant seating in stock form, but Nautique built in an innovative rear-facing bench. It works easily enough, sliding forward on tracks. The bench cushion, which conceals another cushion underneath, then flips up and locks in place to create the back rest. The observer’s lounge also flips up to make the bench a full-width affair. For more information, visit Nautique Boat Company. 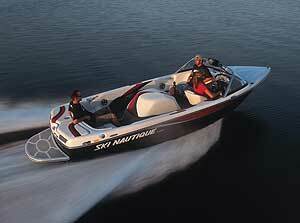 See all listings for Nautique Boats. 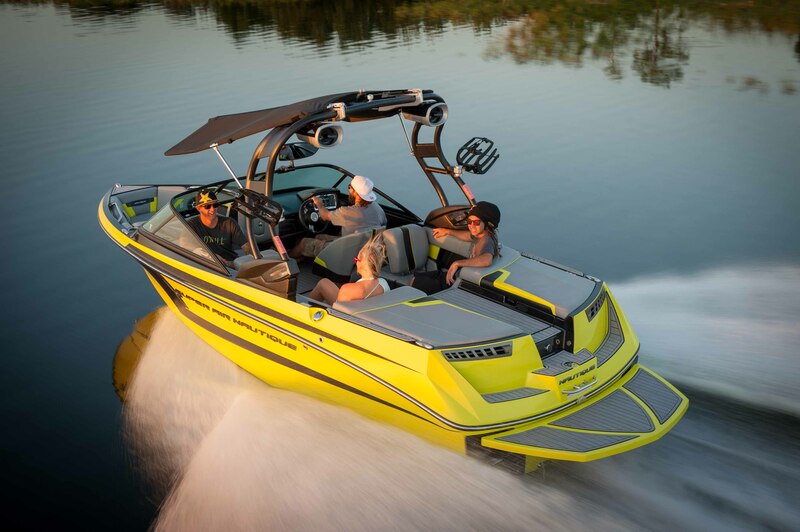 Nautique 200: Time for a New Ski Boat?